Ohh, the joys of being a woman. We have it made, don’t we? With gifts from mother nature like menstruation and urinary infections, it’s obvious that we were build to endure more than the gentlemen. I hope this coupon gives you a bit of ease if a yeast infection decides to poke it’s ugly head. Here’s a way to reduce the symptoms as fast as possible. 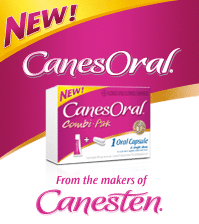 CanesOral is offering this coupon for $5 off your next purchase. Simply print out the coupon, and present it with your item. I ❤ saving CASH.